Going to throw out a couple of numbers for you. Ready? 232. That’s how many inches of snow they have at Leavitt Lake near Sonora Pass. 19.3 That’s the same snow depth, in feet. If we happened to live at Leavitt Lake, and you dug down four feet into the snow pack, you would find the roof line of our house. What I’m saying here is that they have a lot of snow up at Sonora Pass. This is of interest to us because we take that pass over to Bridgeport in May for the Mountain Warfare Training Challenge. 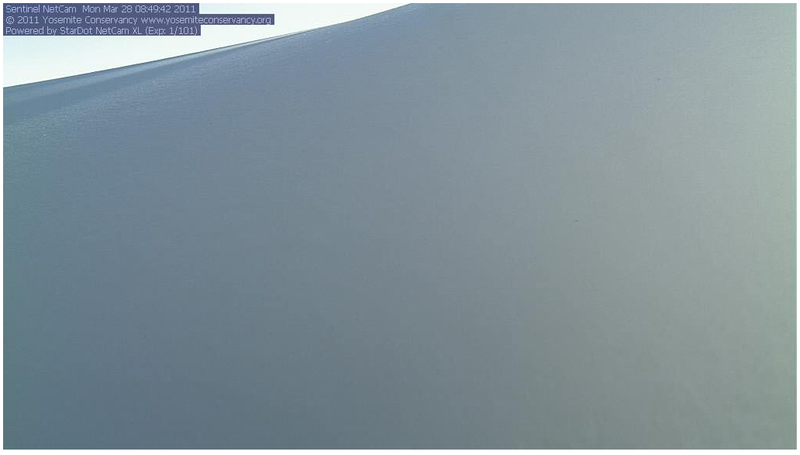 Today’s webcam view from Sentinel Dome in Yosemite. Might want to check back in a couple months for the view of Half Dome.